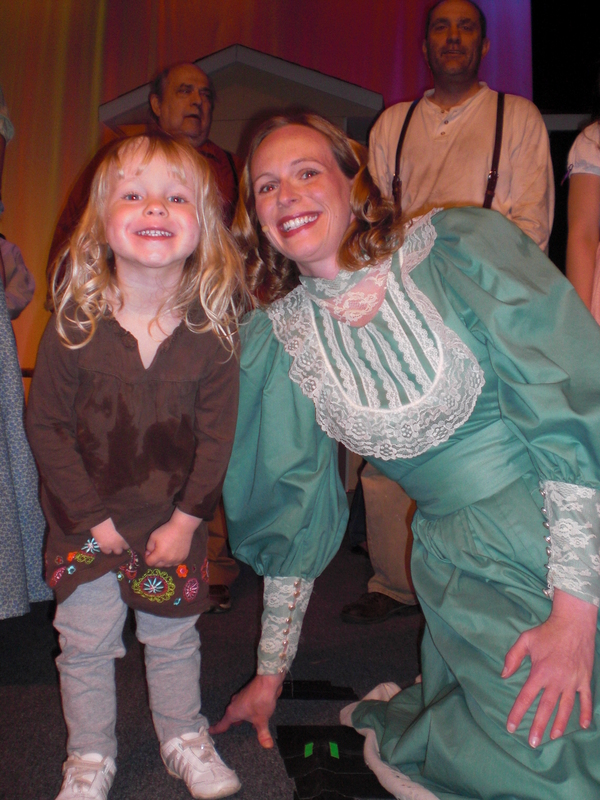 Here is a photo of me and my daughter right before “Oklahoma!” She got a little wet playing in the sink while I did my hair and make-up. Book Update: I finished “Why Calories Count” and found it a great companion to “The End of Overeating” in that it goes more into studies about what is going on in the body. Now, I started “Raising Happiness” by Christine Carter which is actually just a book that relates everything I learned in Positive Psychology and applies it to families. I get a lot of questions asking what I get at Trader Joe’s. There isn’t one around here, so here are my picks for what to buy or try. Most of the food is canned or freezable since we do not live close to one. Here are a few more to what list I had created a while back. 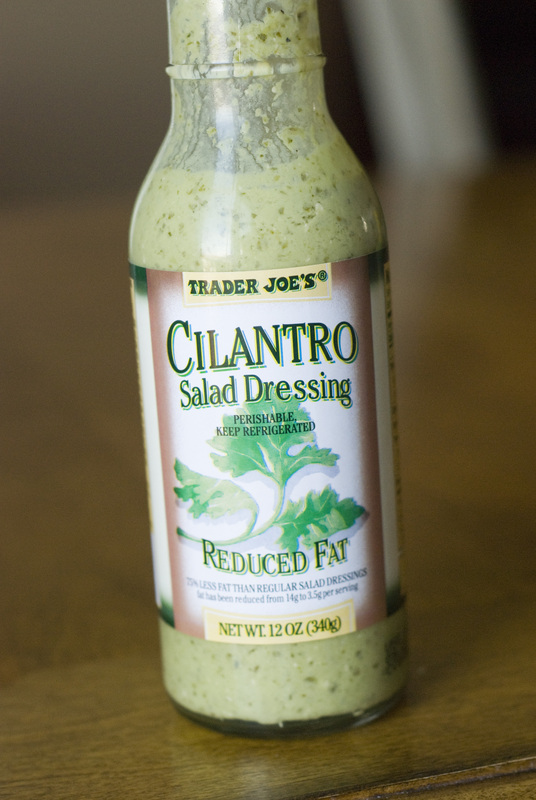 Cilantro Dressing – THE dressing for cilantro lovers. 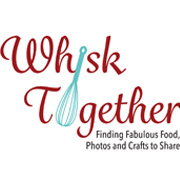 Slightly thick and dresses up anything from salads to deli meat wraps. You find it in the refrigeration section instead of the normal room temperature dressing section. 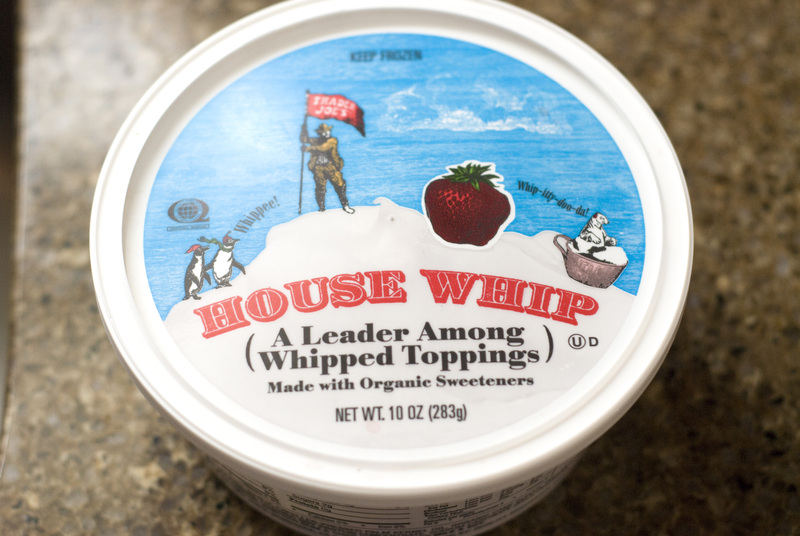 House Whip – After looking at TruWhip at Dierbergs, I informally conclude they are the SAME product. They have the same ingredients and the same nutritional facts. The only difference is that Trader Joe’s sells it for $1.99 per tub and Dierbergs sells is for $3.29 per tub when on sale. 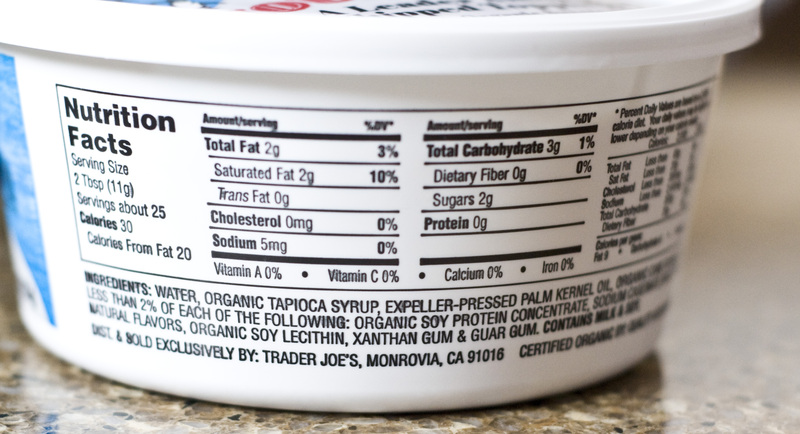 There are no artificial flavors or colors, no high fructose corn syrup and no hydrogenated oils. Pretty much the only alternative to Cool Whip that I have found unless you make your own. 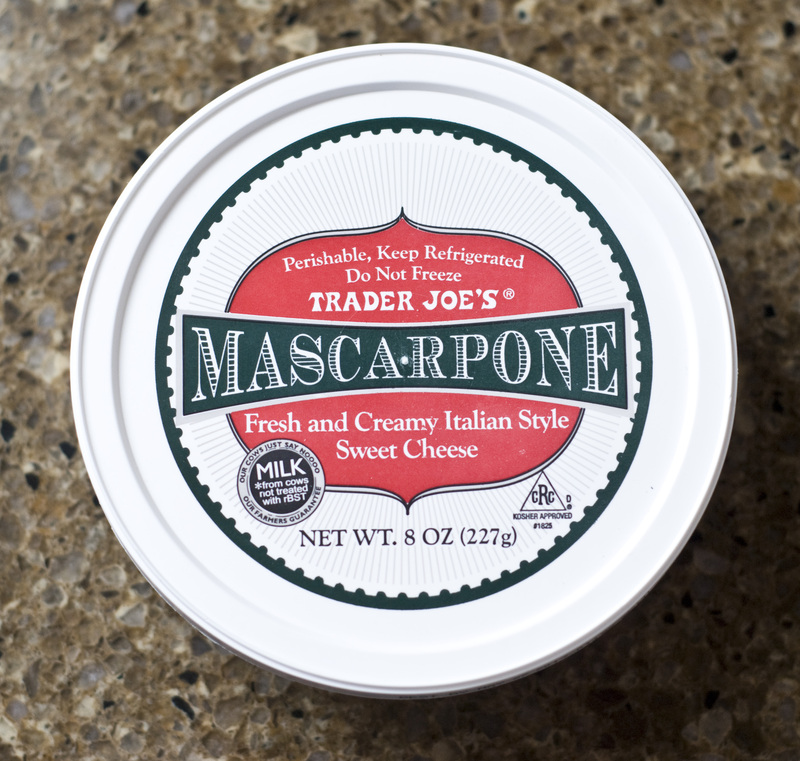 Mascarpone – You can actually find this at Aldi sometimes as well. But, it is a specialty item there and a staple at Trader Joe’s. I love it in tiramisu, this berry tiramisu or these mascarpone blondies. 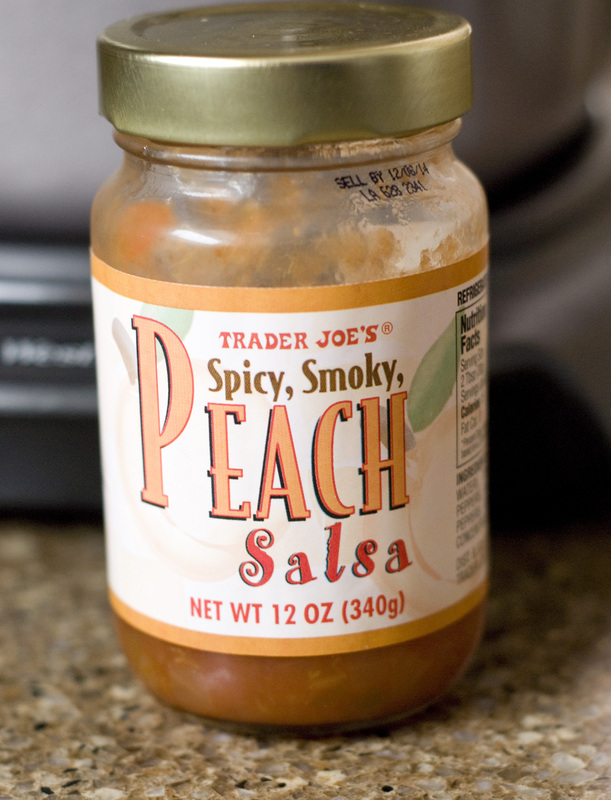 Salsas – Normally, I like fresh salsa… unless it is Trader Joe’s. 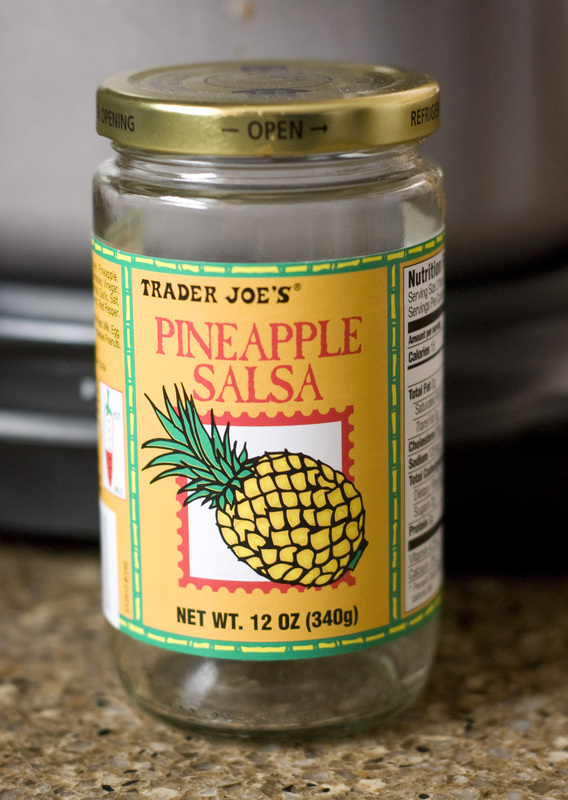 The pineapple salsa is just plain awesome. The peach salsa is a tad spicy. I would call it medium-hot. But, it is still really delicious and both of these taste great with chicken as well for a main course. 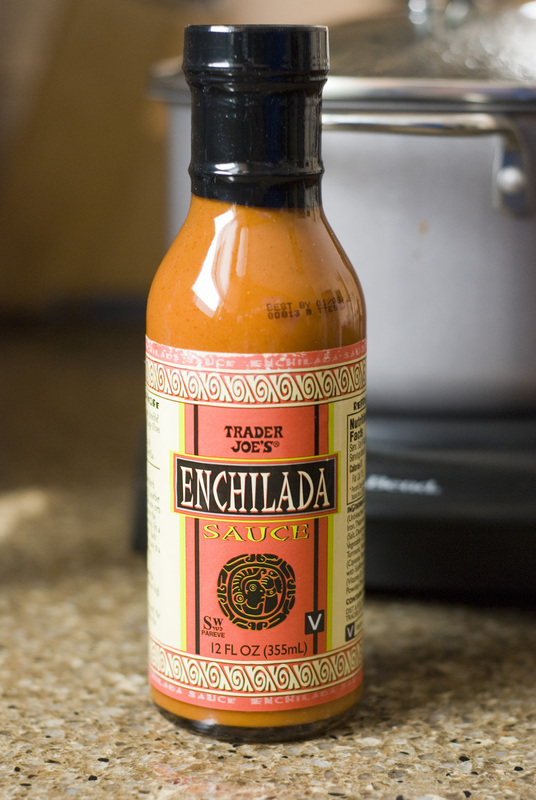 Enchilada Sauce – Again, I think this is a medium-hot product. It’s pretty spicy, but the only enchilada sauce they carry which of course does not contain high fructose corn syrup or anything artificial. It has a great flavor and something easy if you don’t have time to make your own from scratch. 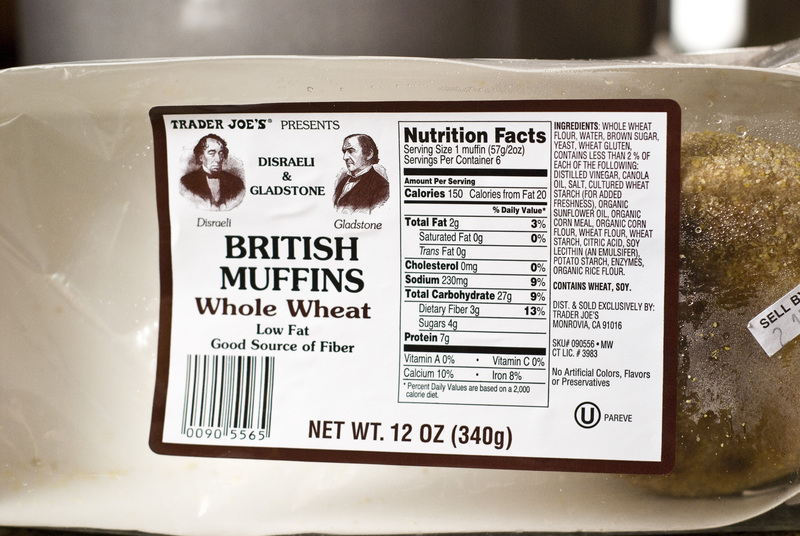 English Muffins– I’m sorry. I just don’t have time to be domestic goddess 100% of the time and make my own English muffins like so many blogs do now. I buy them. For $1.99 I can have 6 muffins that are made from all whole wheat flour with no artificial anything. They freeze well, too. 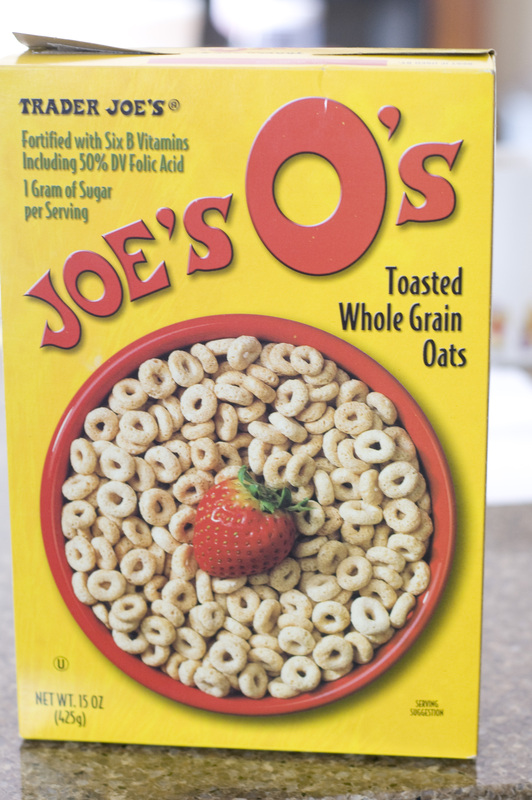 Joe’s O’s – These are basically Cheerios. I found one story rumor that stated they are General Mills Cheerios rejects, but I don’t find that to be the case. They are $1.99 for a 15 oz box which is pretty cheap compared to the name brand and some generics. Ingredients seem to be about the same though since General Mills doesn’t add much to them. 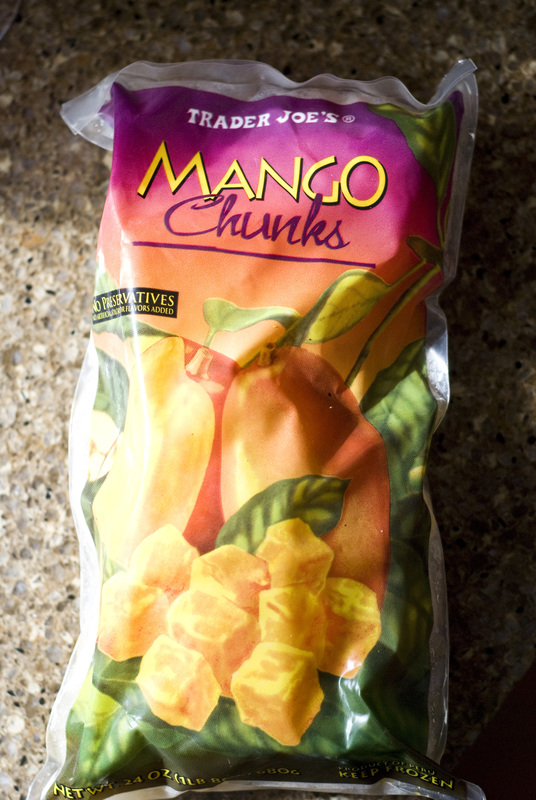 Frozen Mango Chunks– I LOVE these. They are $2.69 per bag of 24 ounces. I love them in plain yogurt. I love them by themselves. I love them thawed and with a dash of cinnamon. I love them on a boat. I love them in a moat. I love them in smoothies. I love that they’re incredibly high vitamin A and C. You get the picture. Lemon Curd – Lemons can be expensive many days of the year and therefore, it is expensive to make your own lemon curd. 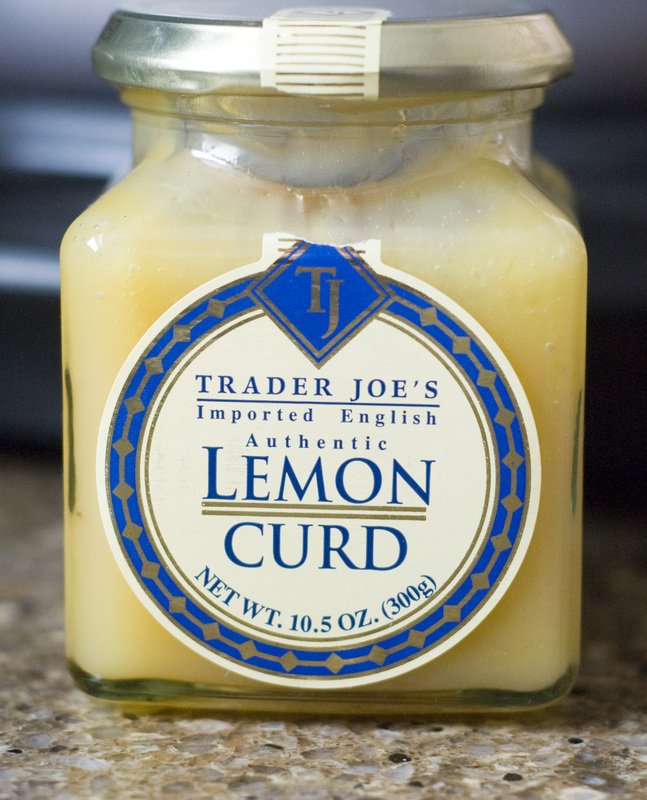 This puppy was like $3 and has nothing in it but I what I use to make my own lemon curd. 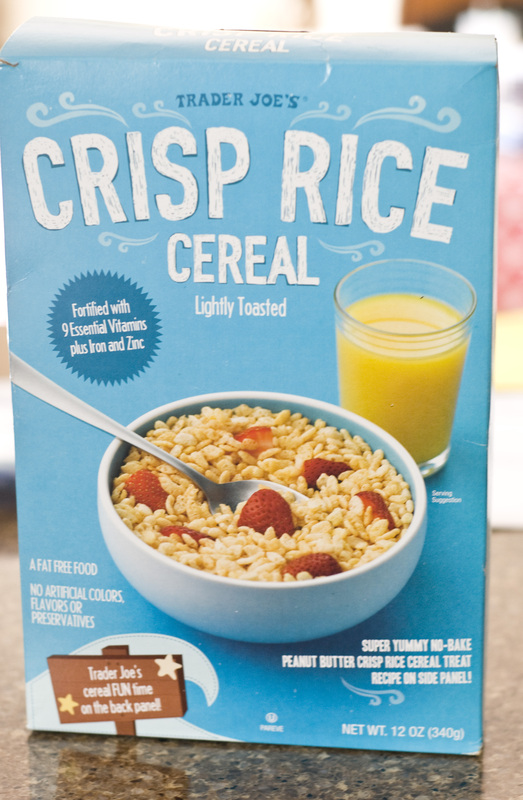 Rice Krispies, but not – It is really hard to avoid BHT in the cereal aisle. We all love rice krispy treats and I like to make homemade granola bars, but trying to avoid preservatives is really difficult without Trader Joe’s. 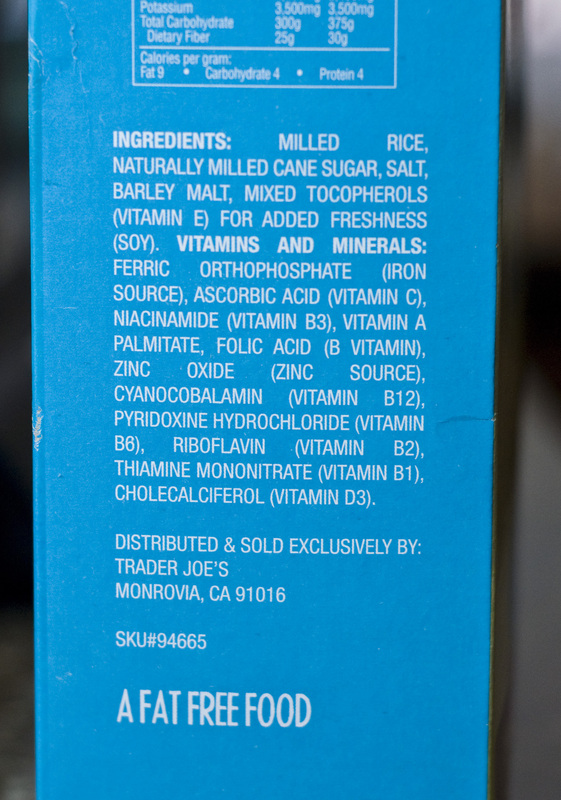 Here is a list of the ingredients as well. We eat these instead of Kellogg’s and the price is actually the same or cheaper most of the time. 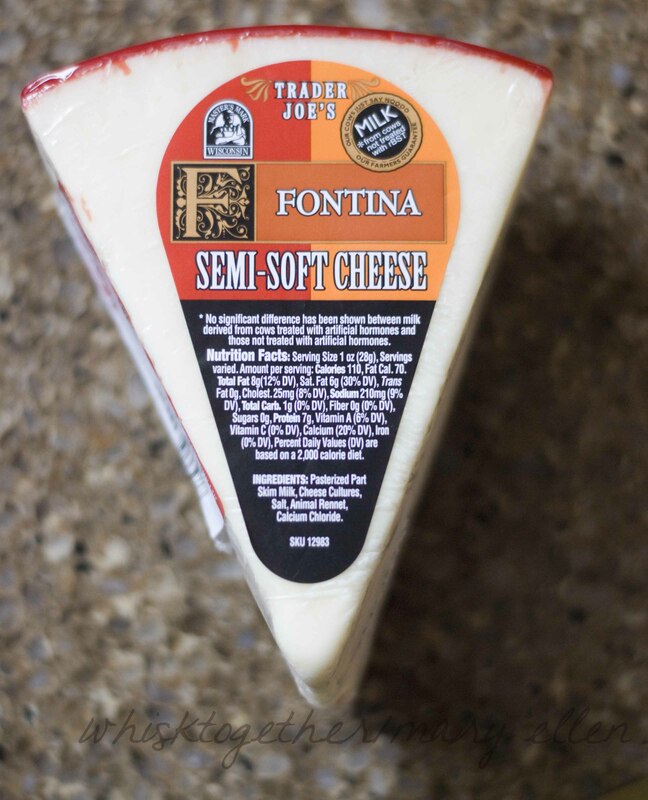 Funky Cheeses – I can always count on Trader Joe’s to have plenty of funky, weird cheeses that I find in Food Network recipes and such. Fontina is pretty common, but many they have are not as common or as cheap. Their brie is the cheapest I have ever found. 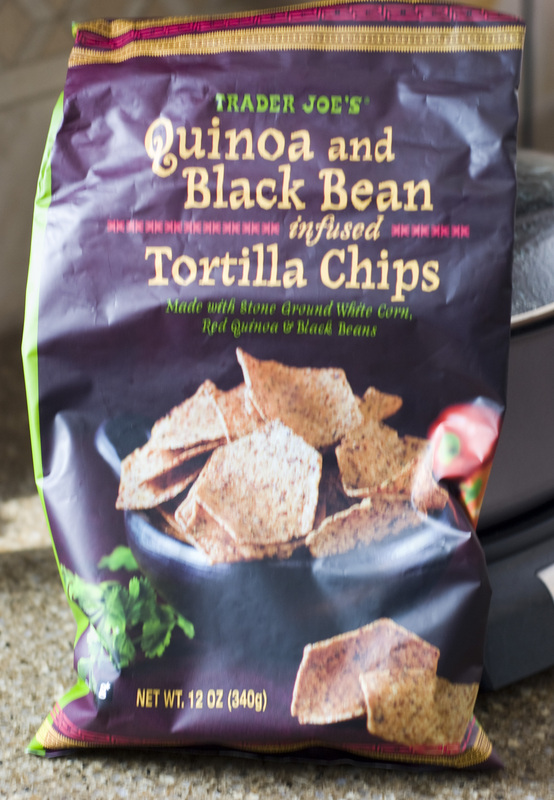 Quinoa and Black Bean Chips – Better stock up on these. They are sold out about half the time I take a trip to Trader Joe’s. The chips are really good – everyone loves the saltiness, crispness and flavor of them. 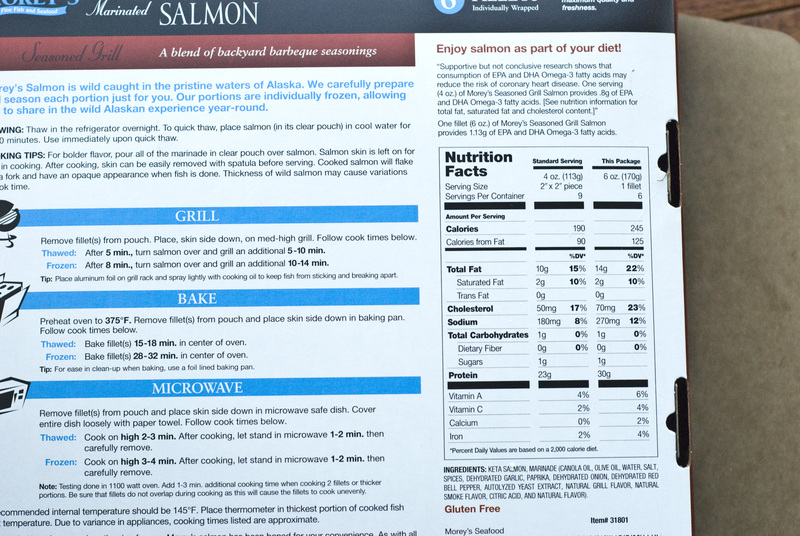 Marinated Wild Alaskan Salmon – If you have TRIED to get on the fish bandwagon in the middle of the Midwest, it may get pricey. This box of 6 fillets is $14.99 which isn’t too shabby considering how large they are and the fact that it costs this much or more to buy them at the regular grocery store. 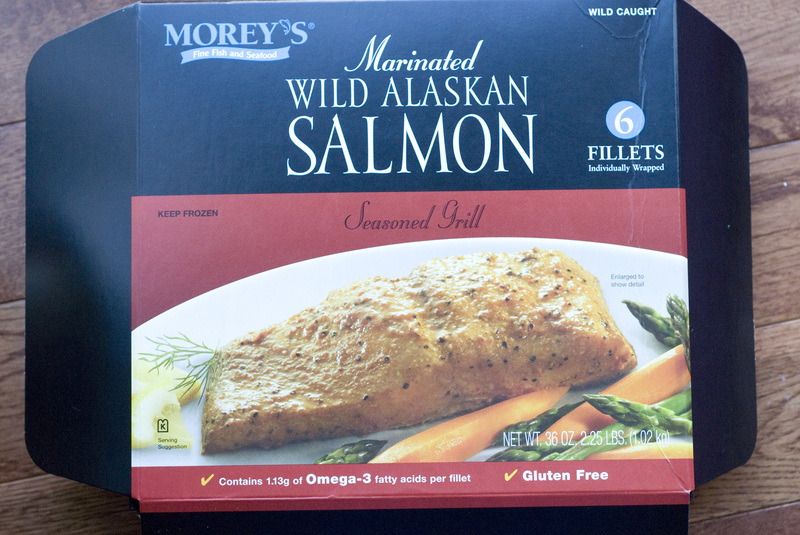 Now, I mean wild salmon – not the farmed stuff from Walmart that is cheaper. 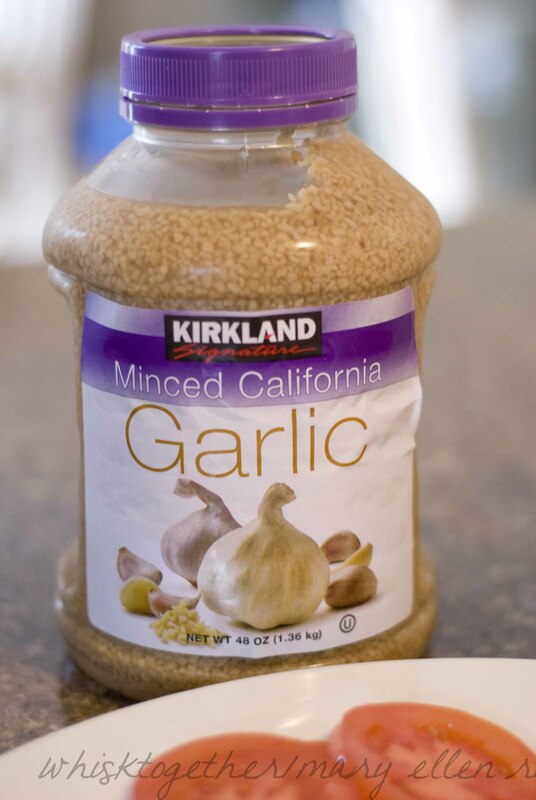 Minced Garlic- This huge jar was like $3-4 at Costco. They are about $5 in most stores. Trader Joe’s started to carry jars of crushed garlic for only $3 or so. It’d take me like $10 in garlic cloves to make that jar. Without a photo: Tyson’s all natural breaded tenderloins (frozen) are less than $3/pound. Stubb’s BBQ sauce is $3 per huge jar and has no high fructose corn syrup, but it does have a kick to it. Sunrise Whole grain Energy Bars! I thought I took a photo of those – love them. $7.70 gives you a huge tub of 32 granola bars made of nothing but real ingredients. The kids can just go into the pantry and grab them, although they are a bit crumbly. Hi! This is Mary O. I’m a friend of Christine’s. I went to Trader Joe’s and bought some things off your list. I got the Quinoa infused chips (love them), JoJos (love), Cocoa Powder (way cheaper than in the store), mango (can’t wait to try), Joe’s O’s (can’t wait to try, but they totally need to change the name. lol.) and asparagus hearts. I love asparagus!! Thanks for the list!! Did I say asparagus hearts? LOL! I meant Artichoke Hearts. I’m a goof. Ooh, Costco has frozen pineapple. I bet that would be good in that smoothie you sent me! You got some great picks to try out!!! Keep letting me know about Trader Joe Products. I will definitely be buying the chips, mango and joe’s o’s and cocoa again. I like the jo jo’s, but I don’t really need them in the house. They are too tempting. Trader Joes doesn’t have frozen pineapple? or is it a better deal at Costco? I will send you more recipes as I find them. Have you ever tried a black bean brownie recipe? I have a really good one if you want it.